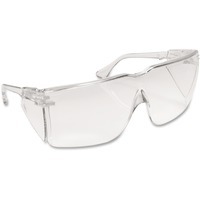 Tour Guard protective eyewear is perfect for site visitors or general use. Design offers impact protection, integral wraparound sideshields and flexible, polycarbonate construction with over the glass coverage. Use indoors or outdoors. Polycarbonate uncoated lens absorbs 99.9 percent of ultraviolet light. Frameless safety glasses are made with durable, sturdy construction.